The challenge: Apply Emtunga is a leading provider of living quarters for the offshore industry. In 2007, we produced a video program that shows how to work safely on Emtunga workplaces but there was no measurable data on how well this actually was implemented in Emtunga HMS work. The solution: By using the video program divided it into different sections, and use our interactive e-learning platform Emtunga will now have a powerful tool that can measure the training efforts in HSE work in a completely new way. The results: By using an interactive e-learning program the risk for injuries on Emtungas workplaces have been minimized. The interactive e-learning is a tool that provides the ability to measure the training effort in safety introduction on Emtungas work places. 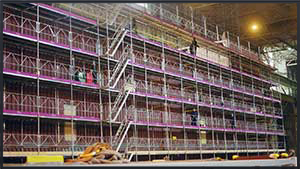 It is also incorporated in the guide line concept the Safe Steps the core of their HSE work. The e-learning program is a useful tool for the subcontractors. For example, there will be a lot of data by monitoring the participants activities that gives unprecedented opportunities to evaluate training efforts and thereby reduce the risk that Emtunga has a person that do not understand their HSE policy. The data is also a useful documentation to present for customers that shows Emtungas in depth and ongoing HSE work. The program is available in Swedish, English, Polish and Hungarian.